Row of new bikes for sale outside a local bike shop in Copenhagen. As one might expect in a cycling nation, bike sales are healthy. 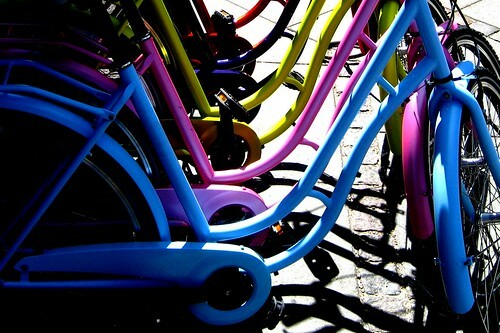 According to the Danish bicycle industry, the good people of Denmark bought 500,000 new bikes in 2006. Not bad for a country of 5.3 million people. It appears to be new record. We here at Copenhagen Bike Culture Blog are guessing that the number will increase in 2007 since we seem to be seeing a lot of new bikes on the streets. The average price of a bike in Denmark in 2006 is 2900 kroner [€386 / $580], which is up from 2500 kroner in 2005. The increase in sales causes a boom for bike workshops, too. While Danes [along with the Dutch] cycle more than any other nation - 1000 km a year per capita - most people can't be bothered repairing their bikes themselves. Whether it is a flat tyre or a rusty chain, Danes prefer dropping them off at a local bike shop. The result is a shortage of bike mechanics in the Danish kingdom. It is estimated that 100 bike mechanics are needed nationwide to keep up with the demand. tags: "bike culture", "bike statistics"